What colour is the fabric on bed from RH? Is it Belgium Linen - Sand? Bed please - Love the bed!!! Could you please share where is the bed from? Hi! 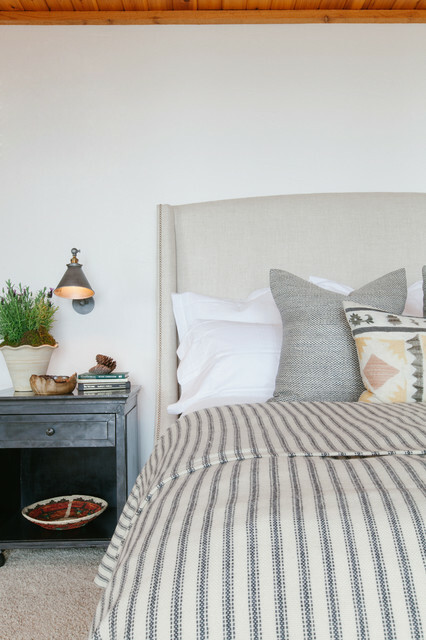 Are you able to share where this beautiful duvet or coverlet is from? Thank you! Bedding - Source please for that gorgeous bedding? Cool nightstands! Where are they from? Sconce - I love the sconce and am wondering about the source. Where did you get the bedspread or the ticking material? where did you find the bedspread/bedspread material ? Where can we get the lamp? Fabric & headboard height - Love this Warner bed!! What fabric & color is this (Belgian linen sand??) and which headboard height is it (54” or 68”)? delicious room. will you share details of sconce on wall? Traditional ticking’s design is a collection of stripes, most notably a wider stripe flanked by two pencil-thin stripes, as seen on these beds. She incorporated more metal with zinc nightstands and sconces next to the soft upholstered bed. Another locally made woven bowl and a carved bowl by a local craftsman warm things up with Sandpoint flavor. Fleming gathered pine cones from the surrounding woods and added them here and there. 3. Ticking. This once strictly utilitarian, usually striped, linen has made its way off the mattress and onto the top of the bed. It lends a classic simple look to a bedroom. 3. Freeze your pillowcase. A cool pillow is a real luxury on a hot summer evening. Try this great hack to keep the bed cool at night: Wrap your pillowcase in plastic wrap and put it in the freezer before bedtime, then pop it back on just before you turn in for the night.Sounds a bit odd, but it’ll provide icy relief on a muggy evening, and the soothing effect should last long enough for you to drift off comfortably.